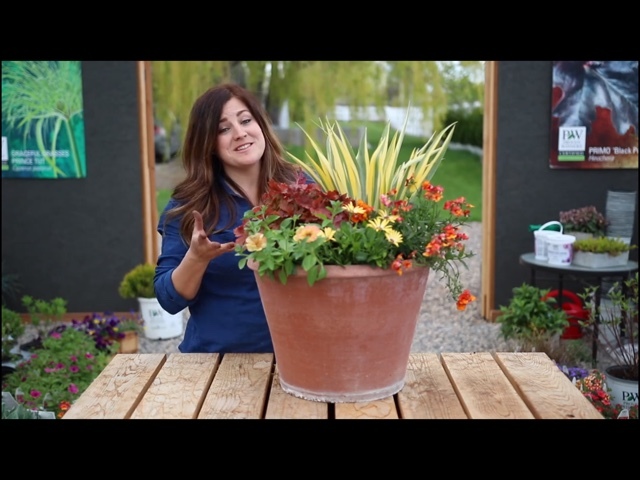 I recently discovered this enthusiastic gardener who along with her husband create videos showing her ideas for planters, and many other subjects. This one caught my attention so I decided to give this design a try. 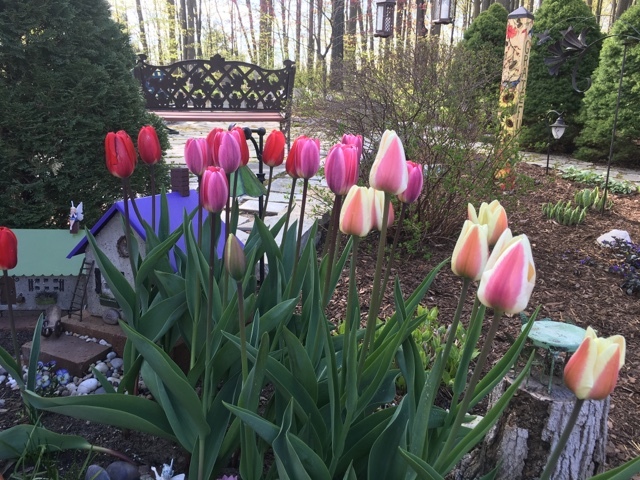 Here is the link to the video where I got my inspiration Garden Answer- April 25, 2017. I don't normally copy ideas but what really made this intriguing to me is the perennial Sweet Iris plant she used in it. As I've learned she often uses a perennial in her annual planters which is totally a new idea for me! 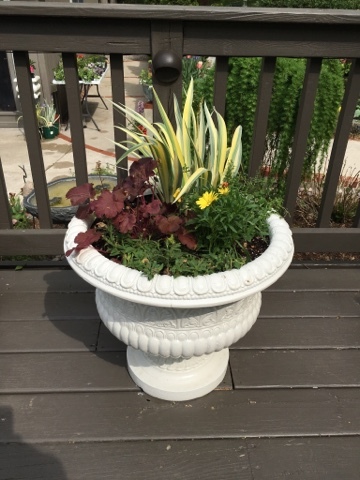 My planter is white so that's a big difference but I found an assortment of the same plants she used and put it together very similarly. Unfortunately all my flowers aren't blooming at the moment but soon enough it will look more and more like hers. She has a ton of videos on Facebook and YouTube . I noted one of the videos has been viewed over 1,800,000 times! 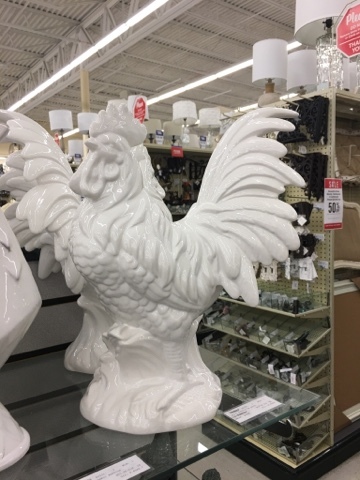 I have a very large white rooster I found at Cracker Barrel about 6 years ago. I've been asked numerous times where to get it but of course there are no more of them. I was at Hobby Lobby the other day and look what I found! It's really close to the same look although it is smaller. I even copied the store label in case it would help anyone that wants to find it. 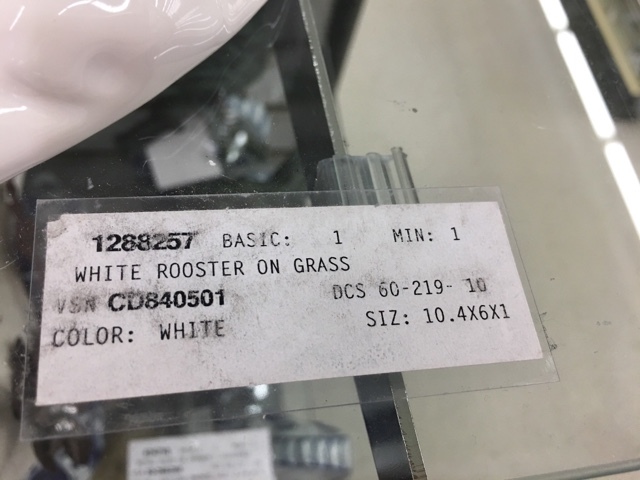 This is a link to a post where I talked about finding another white rooster which also shows a picture of mine. Click "here"
I've just begun to fill my planters with annuals. I have a bunch more to go. This is what keeps me happy and busy during the summer. 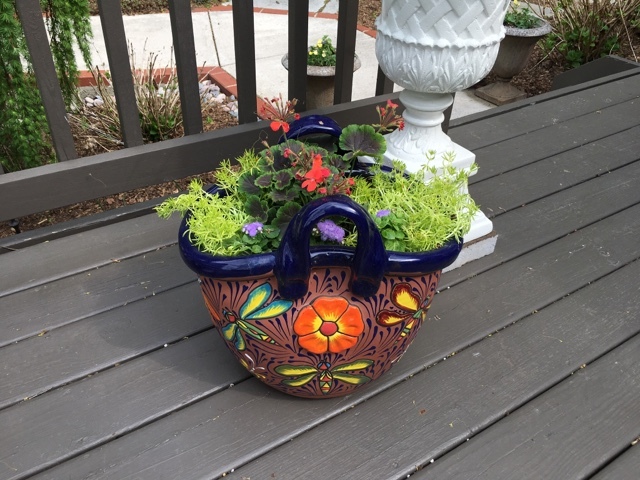 This big terracotta planter from Mexico was gifted to me by my hubby for Mother's Day. I spotted it at a garden center and fell in love with it. It's pretty large and I stuffed it with a bunch of annuals. Can't wait to see it as it starts to fill out more. I'll be update things like this on my garden blog. 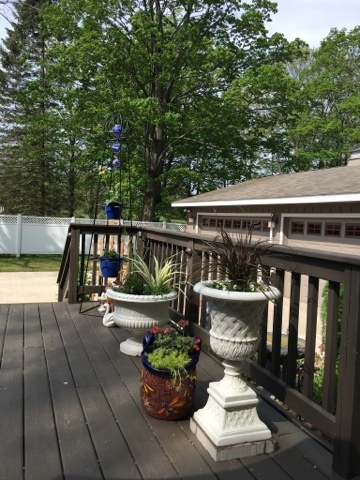 We are just now starting to get heavy pollen here and the trees are dropping their debris everywhere so my deck is messy! 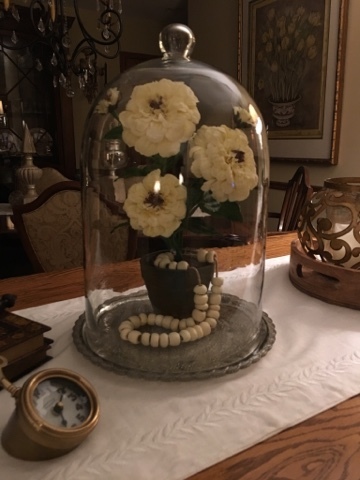 While on a trip up to Petoskey we stopped at Monarch again and I spotted a huge glass cloche on display. I was again inspired when I saw this zinnia plant inside of theirs. 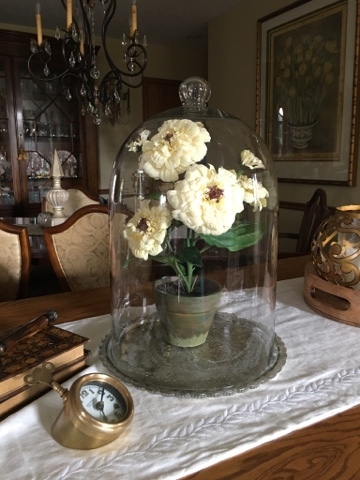 I have a big cloche too and decided it was time to create a new look for it. Extremely simple but I like it! I updated it by adding these wooden beads. So that's my This and That This Week! 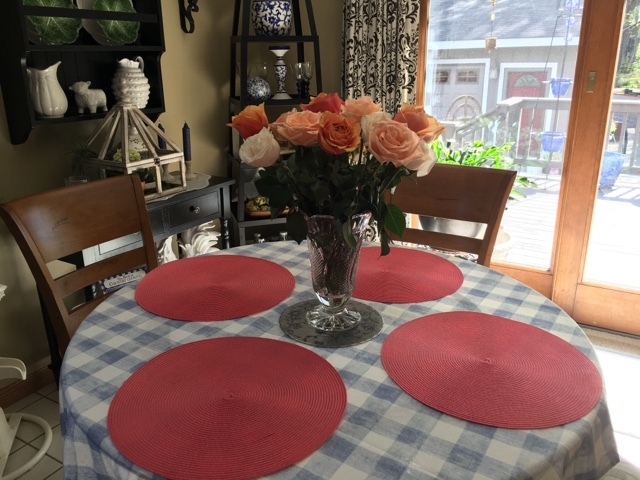 Last week I created a tablescape using these beautiful roses I purchased and put in a pretty glass vase. 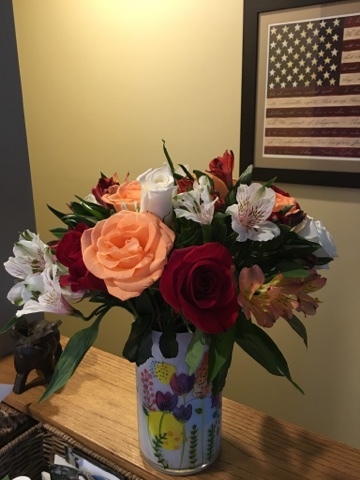 The day after my post I received a special delivery from our Son, Daughter in-law and Grandson of this mixed arrangment with gorgeous roses in a hand painted vase as a Mother's Day gift. 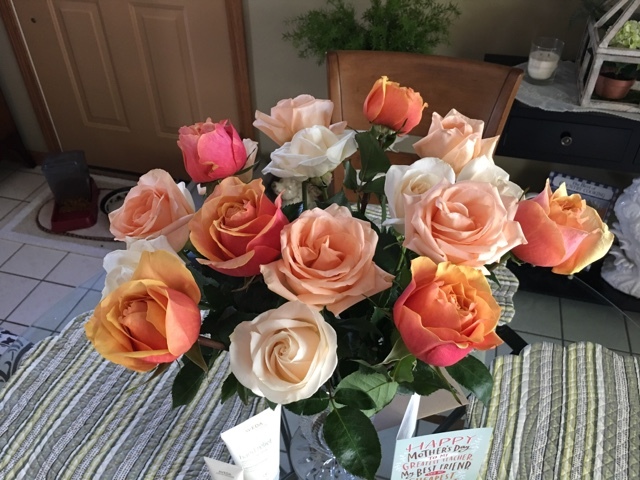 Two days later our daughter came home to visit for Mother's Day and she brought this bouquet of roses in beautiful shades of peach! 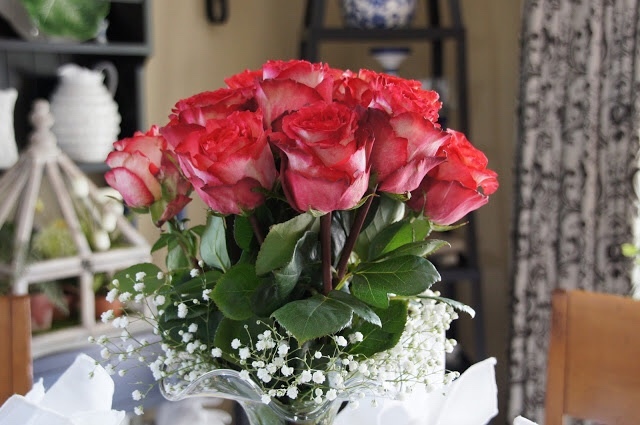 She placed them in my crystal vase which created a very elegant look. Now I was perplexed as to what I was going to do with all the arrangements! 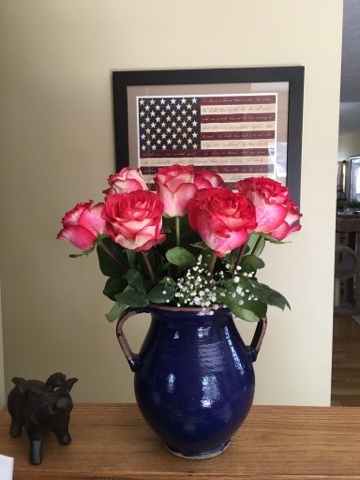 I decided to transfer the red roses into this ceramic vase and placed it on the wood top by the stairs and kitchen area. 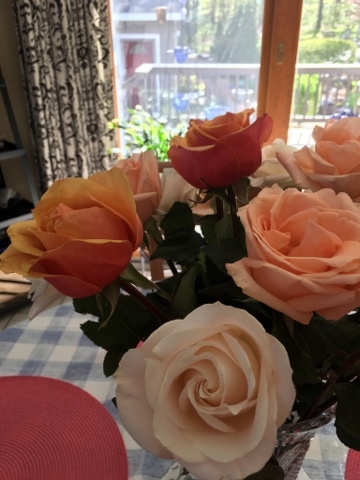 The roses took on a whole new look in this vase! Sunday morning I was prepping the table as our daughter made breakfast. 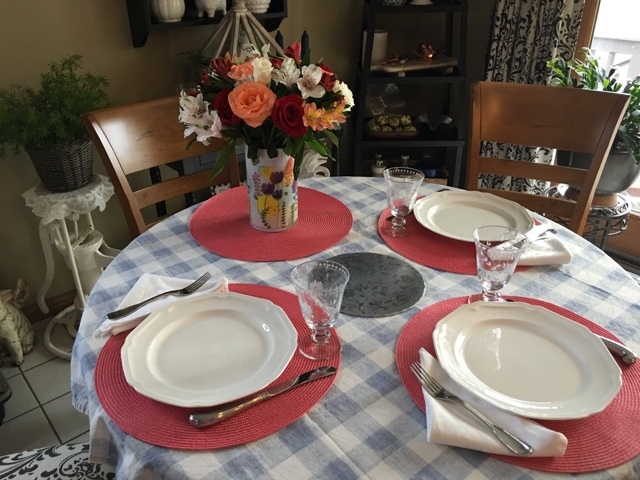 I chose these placemats to play up the colors in the arrangements. 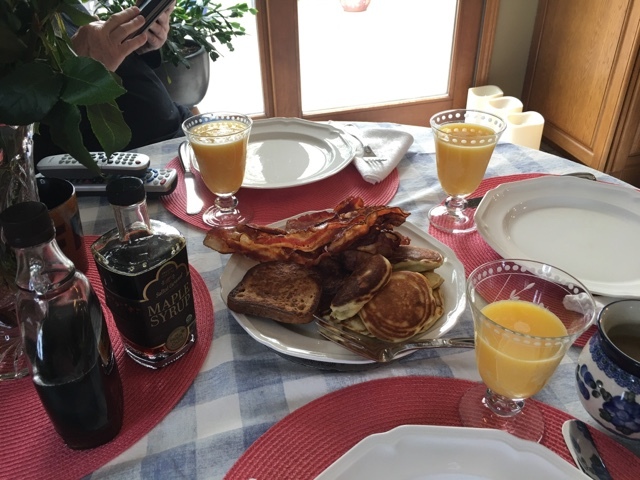 If you read my tablescape post I had shared the Creme brûlée French toast but those plans got nixed, and we decided on blueberry pancakes, scrambled eggs and sea-salt bacon! I used a syrup I found at T.J. Maxx which consists of Vermont Maple Syrup, infused with caramel and sea-salt and it was delightful on the pancakes. 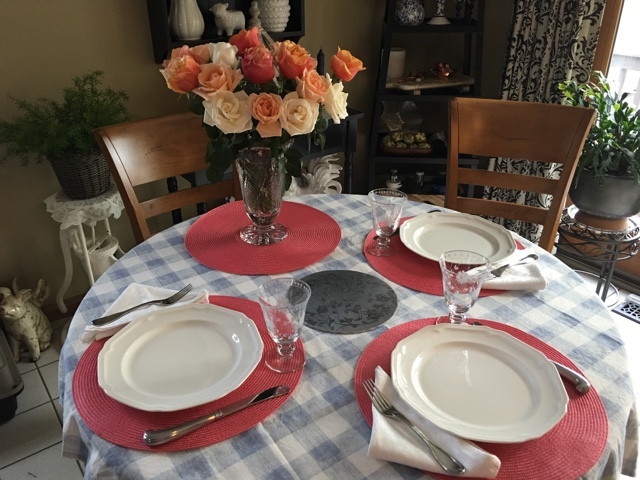 I staged the table with both floral arrangements. 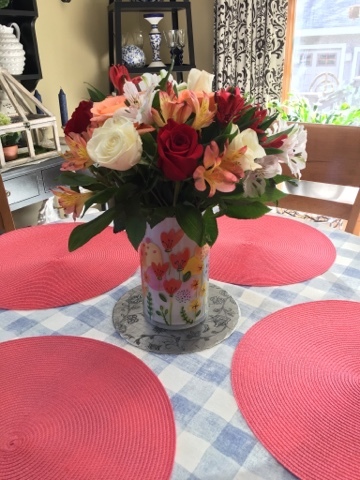 After breakfast I decided that son's arrangement would stay in the kitchen. 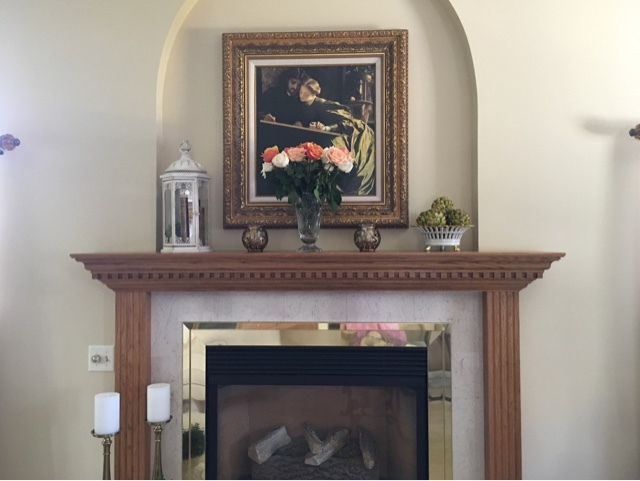 I moved daughter's arrangement to the mantel which graced it beautifully. 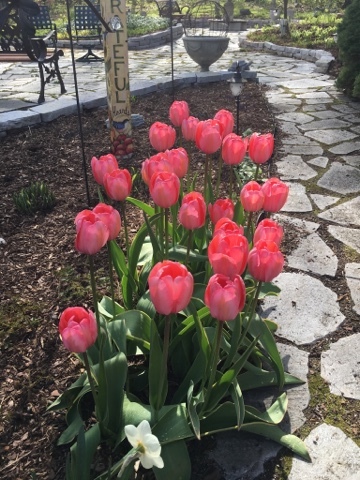 I've been blessed with some gorgeous tulips now for the past two weeks. Spring has come on in full force and I'm loving each minute of it!